“But in thus emphasizing the unconscious in mental life we have conjured up the most evil spirits of criticism against psycho-analysis. Do not be surprised at this, and do not suppose that the resistance to us rests only on the understandable difficulty of the unconscious or the relative inaccessibility of the experiences which provide evi­dence of it. Its source, I think, lies deeper. In the course of centuries the na‹ve self-love of men has had to submit to two major blows at the hands of science. The first was when they learnt that our earth was not the center of the universe but only a tiny fragment of a cosmic system of scarcely imaginable vastness. This is associated in our minds with the name of Copernicus, though something similar had already been asserted by Alexandrian science. The second blow fell when biological research de­stroyed man’s supposedly privileged place in creation and proved his descent from the animal kingdom and his ineradicable animal nature. This revaluation has been accomplished in our own days by Darwin, Wallace and their predecessors, though not without the most violent contemporary opposition. But human megalomania will have suffered its third and most wounding blow from the psychological research of the present time which seeks to prove to the ego that it is not even master in its own house, but must content itself with scanty information of what is going on un­consciously in the mind. We psycho-analysts were not the first and not the only ones to utter this call to introspection; but it seems to be our fate to give it its most forcible expression and to support it with empirical material which affects every individual. Hence arises the general revolt against our science, the disregard of all considerations of academic civility and the releasing of the opposition from every re­straint of impartial logic” (Standard Edition, 15, 284-5). 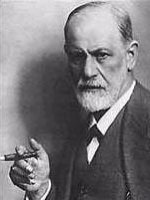 Of course, Freud’s idea has since been reformulated many times, by many authors. Extremely interesting. I now know why Freud’s followers keep constantly comparing him to Copernicus and Darwin. Thanks, Emma. We’re always glad if our work can be of any use. And I learned something from you, too: who Emma Eckstein REALLY is/was. Interesting story, I’ve never heard about her before.